I always have this idea that if I just had some time off, I would try out all those recipes I’ve been saving and bake up a storm of impressive concoctions. One impediment, though, is that I generally spend my vacations at various family members’ houses. Right now I’m visiting my dad, and while he’s a pretty accomplished cook, I don’t think anything has been baked in this house for the past decade or so. In practical terms, that means I don’t have my embarrassingly large collection of baking equipment and ingredients at hand, and need to stick to projects that are slightly more normal than what I may have had in mind. 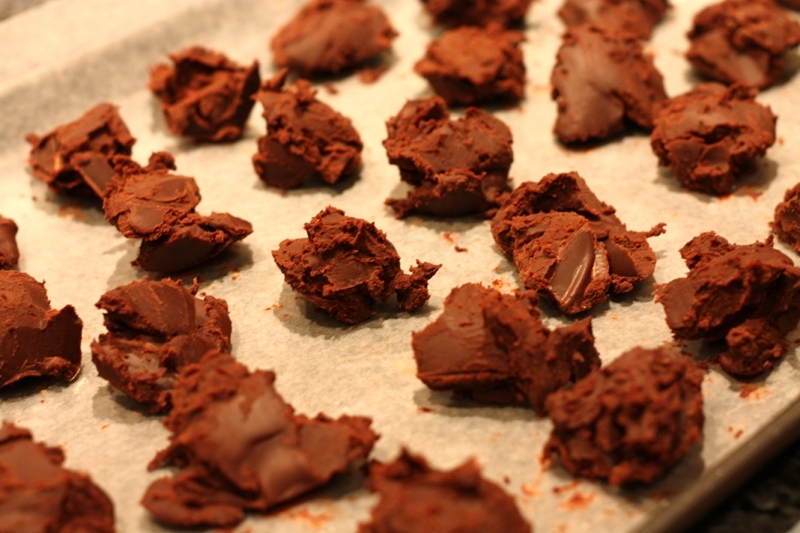 Enter chocolate truffles. 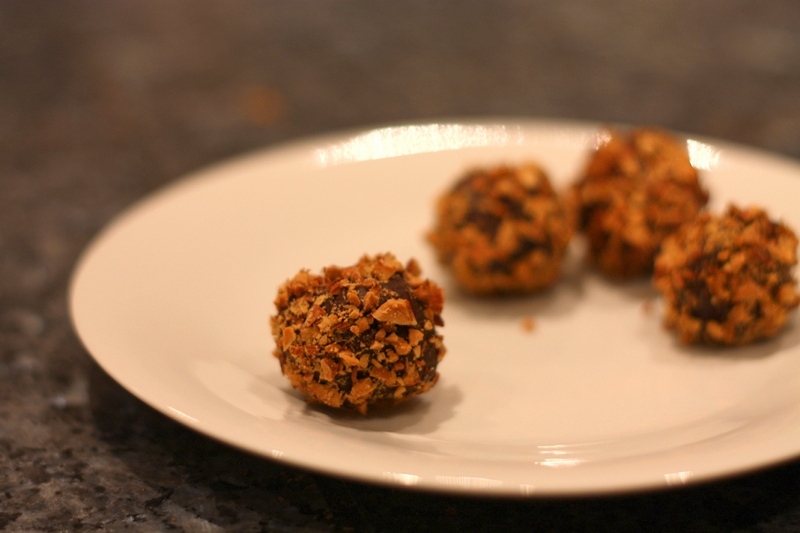 This recipe is the absolute simplest I’ve found for truffles. No tempering chocolate, no straining cream – only the essential steps, and the result is still decadent and luxuriously smooth. It does take a few hours of chilling time, but your work is incredibly minimal, aside from the necessary rolling (which takes me about 20 minutes, but I’m slow), and it calls for only four ingredients. The recipe is also a great base for any flavour additions you may have in mind: for example, my favourite variation is to roll the truffles in toasted chopped almonds, and you could also add a splash of your favourite liqueur to the ganache base. They also make great Christmas presents! Because they’re beautiful and delicious, and who doesn’t like chocolate? Okay, some people, but then keep the truffles for yourself and all is well. The only note: these are easy to make, but the quality of the ingredients makes all the difference. Since a truffle is basically a chocolate vehicle, the chocolate you use is the main factor for the final taste. Get as high-quality as you’re willing to pay for – I used Callebaut, but Lindt would probably also be good. Bring cream to boil in heavy medium saucepan. Remove from heat. Add chocolate; whisk until melted and smooth. Whisk in vanilla. Pour into medium bowl. Cover; chill until firm, about 3 hours. Line baking sheet with waxed paper. Drop mixture by rounded teaspoonfuls onto prepared baking sheet. (If your drops are approximately spherical, this will make your life much, much easier in the next step. If they’re flat like in my picture, you might regret it.) Freeze until firm, about 45 minutes. 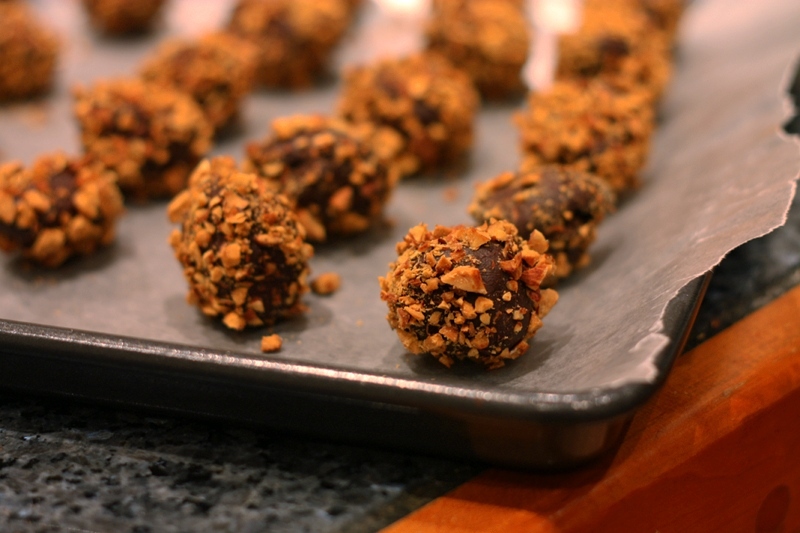 Note: An extra bonus to using nuts is that no one can tell if you failed dramatically at making your truffles spherical. Yay! You are currently reading simplest truffles at one cake two cake.